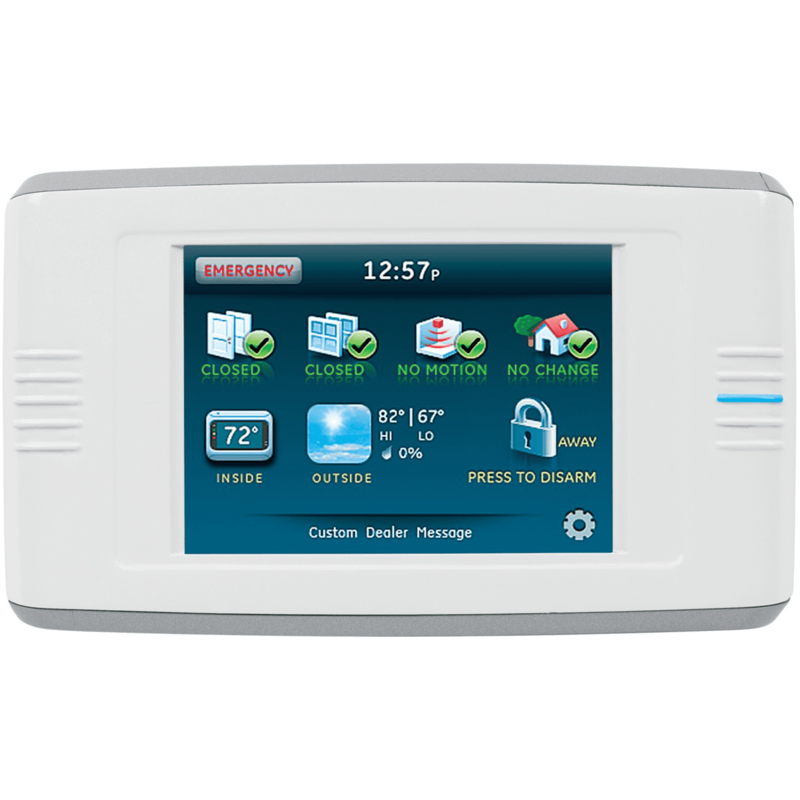 The Interlogix 60-924-RF-TS5-2 is a two-way, talking, wireless, color 3.5" LCD touch screen featuring a user-friendly interface that compliments Simon XTi-5 Version 2 security systems for safety and peace of mind. In addition, optional wireless devices can be added to provide control over other functions including Z-Wave® wireless lighting control devices, Z-Wave wireless thermostats for home HVAC systems, and Z-Wave door lock control. This touch screen is the ideal solution for providing additional points of control throughout the home. Up to four touch screens can be installed in one home for maximum convenience. The 60-924-RF-TS5-2 touch screen's interface has been carefully designed to provide home status information at a glance that is intuitive and easy to use. The wireless device installs quickly with minimal disruption and works seamlessly with optional Alarm.com Web portal and mobile applications. These applications can provide additional lifestyleenhancing information such as the current outdoor temperature and a four-day weather forecast. At-A-Glance Home Status: Quick, at-a-glance home status provides a complete view of home systems including security, indoor temperature and weather. Security System Control Via Convenient Keypad: Large keypad makes security system operation user-friendly. Thermostatic Control: Thermostatic control makes it easy to set automation schedules in conjunction with lighting and security events to save energy and reduce utility bills. Four-Day Weather Forecast: Four-day weather forecast provides helpful information quickly and conveniently. Remote Access: convenient interactive services available through Alarm.com. Lighting and Locks Control: Integrated lighting control capability through Z-Wave® lighting, and deadbolt lock control devices. Wireless Thermostats: Programmable HVAC control available through Z-Wave wireless thermostats. Wireless Door Lock Control: Z-Wave door lock support and status.